Our only major loss in the six years we’ve been gardening by the coast was a particularly tragic one. 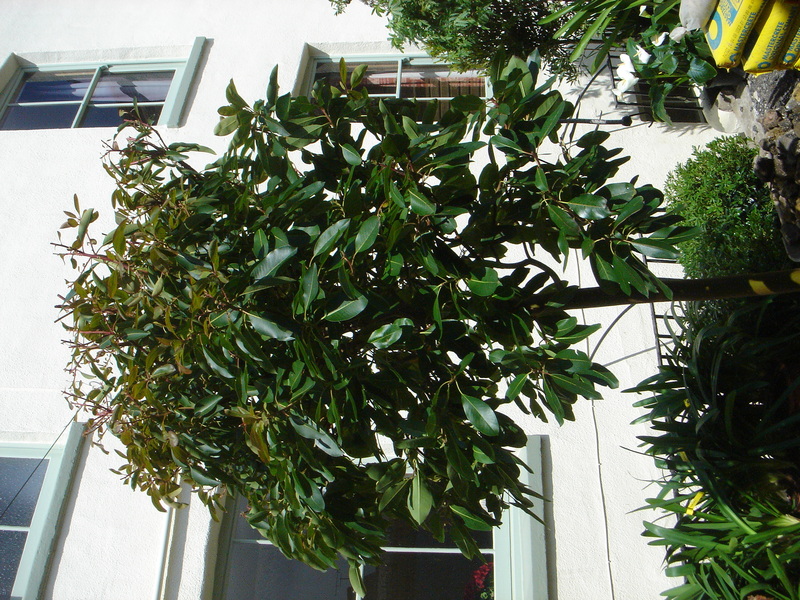 The original planting focussed on a beautiful standard specimen of Arbutus glandulosa (Mexican Strawberry Tree), known thereafter to us simply as the “Orange drainpipe tree”. 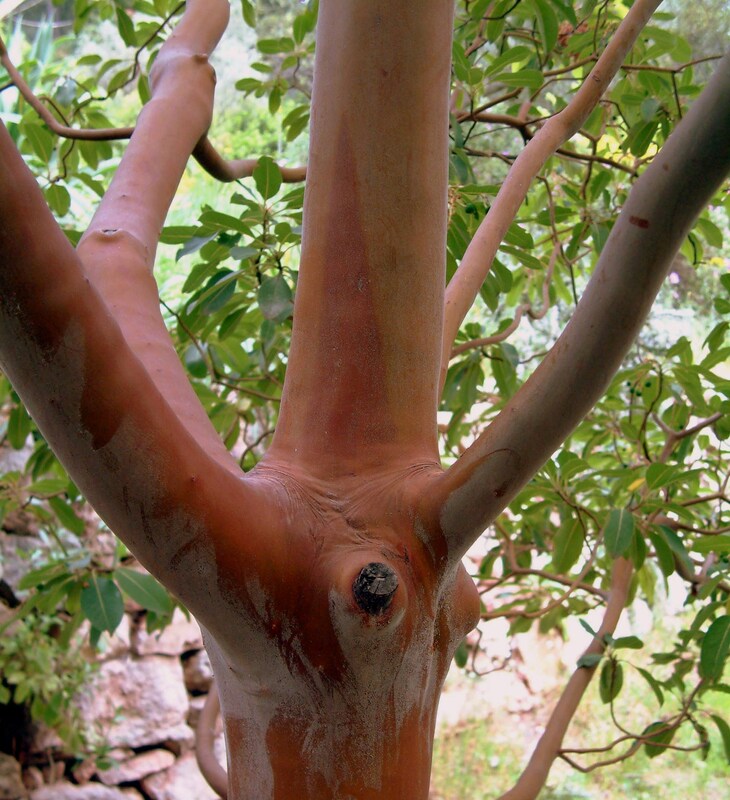 Arbutus glandulosa is a very classy tree, valued primarily for its velvety-smooth orange bark, which occasionally develops a white bloom (see below). It also has large, glossy evergreen leaves, which first emerge in spring with reddish tinge. The flowers, which we only had the opportunity to enjoy once, are a little like Enkianthus – pearly white bells in long clusters. A fibrous root system means this tree can be grown close to the house as it won’t cause any structural problems. Annoyingly, a neighbour’s cat also found it to be an excellent scratching post. As the first flush of new leaves appeared the year after planting, it was clear that all was not well. The older leaves started to turn blotchy and the new ones started to droop and dry out. After a few weeks it was clear that the top of the tree was being starved of water and was dying back. We took advice and pruned the branches hard in late spring, which should have resulted in new growth appearing a couple of months later, but it was too late. With the help of the RHS advisory service we later discovered that the cause was Pythium – a nasty pathogen which causes infected plants to collapse and die. Once Pythium is in the ground it’s not wise to replant with the same thing, or any members the oak or rose family as these might also be susceptible to infection. 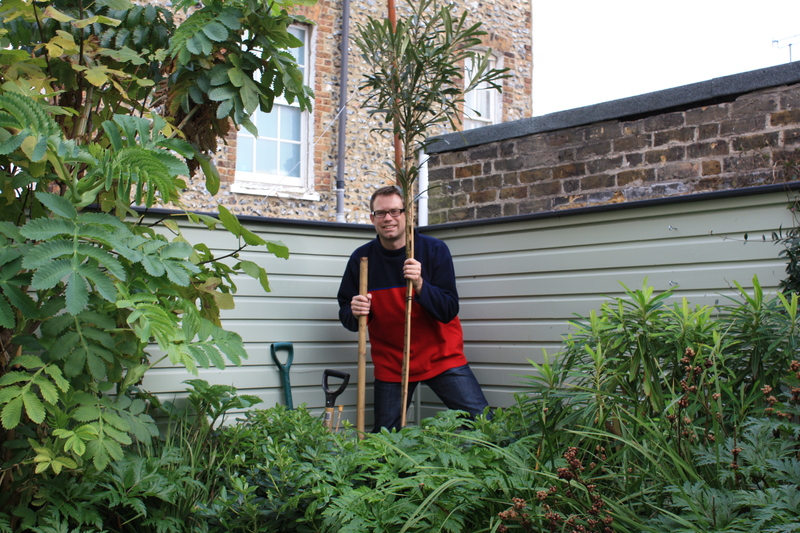 The nursery’s suggestion was to replace with a very different and equally unusual tree, Pseudopanax chathamicus, the Chatham Island Lancewood. It’s so unusual that there’s hardly any information available about this curious evergreen tree, apart from in Christine Shaw’s brilliant book “Architectural Plants”, which would be one of my desert island books if ever I was cast away. Like other Pseudopanax, there is very little that is normal about this fella. It is desperately slow-growing – 5 years after this picture was taken it is scarcely any bigger – and the leaves are long and leathery. They will become shorter and wider as the tree matures, although at this rate I may be retired by then! Its speed of growth is down to the root system, which is particularly slow to develop. Staking, which I am doing below, is therefore essential. Pseudopanax chathamicus is allegedly of doubtful hardiness, but with us it withstands cold winds and the occasional frost without blanching. We are waiting for the year when it finally feels happy enough to develop a decent crown, rather than looking like a rather stumpy firework. It’s no trouble to grow and perfect for underplanting as it casts very little shade. If you’ve tried everything else, this is definitely a tree to seek out. In the UK I would always recommend Architectural Plants in Sussex, who have the most stupendous array of good quality plants and trees, including both of the above. Does anyone have any experience of the above trees, or any advice on how to grow them successfully? If so, please share!